We are a contemplative order, centred around the Liturgy of the Hours and the celebration of the Eucharist. We also provide hospitality to our guests. Our order originated from the Bridgettine Order, founded by St. Bridget of Sweden in the 13th century. This first order was reformed in the 20th century by our Reverend Mother Elizabeth Hesselblad, also born in Sweden. 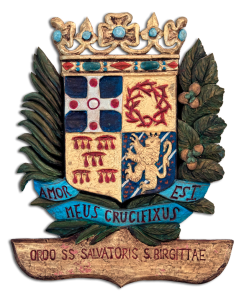 We Bridgettine Sisters belong currently to “The Order of The Most Holy Saviour” (Ordo Sanctissime Salvatoris) which has its seat in Rome. 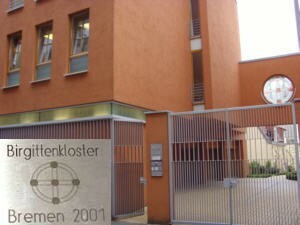 Our convent is located in the towncentre, in the oldest part of Bremen, the so-called “Schnoor”-area. Our convent guest-house, the enclosure, the light-filled chapel and the small convent garden form a pleasant oasis within the bustle of the ancient Hanseatic city of Bremen. 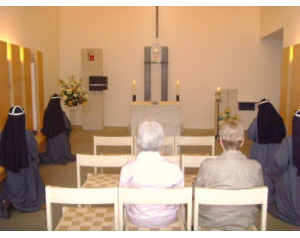 Guests as well as locals enjoy our convent as a place of withdrawal and silence. 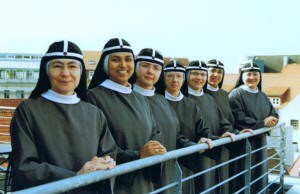 We are a small convent with 7 religious sisters. Our sisters come from Italy, Poland, Mexico, India and Germany. Copyright © 2019 Birgitten-Kloster Bremen.